Kungfu4less.com is offering excellent Sai martial art training weapons, like the Regular Sai, Mini Sai, and Aluminum Color Sai etc. at economical prices. 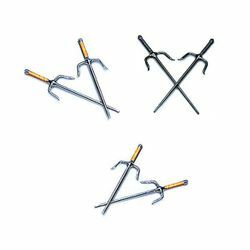 There are different types of this martial arts implement and here at Kungfu4less.com, we are able to offer a wide selection for you to choose from. The Sai is a popular weapon used in Okinawan martial arts. It is generally in the form of a pointed prong. It also has two curved prongs projecting from the handle. These weapons are of various types. The various parts of the Sai are Monouchi, Yoku, Tsume, Moto, Tsuka, Tsukagashira and Saki. This weapon is used in pairs, with each hand holding one. Usage of the point, knuckle and central bar is given importance along with rapid grip changes for numerous strikes and blocks. The Sai is mainly a striking weapon, but it also offers defensive techniques. For those looking for durable Sai weapons like Regular Sai, Mini Sai , Aluminum Color Sai etc., and Kungfu4less.com is here to help. We have a huge variety of items available.